Small constrained peptides combine the stability of small molecule drugs with the selectivity and potency of antibody-based therapeutics. However, peptide-based therapeutics have largely remained underexplored due to the limited diversity of naturally occurring peptide scaffolds, and a lack of methods to design them rationally. New computational design and wet lab methods developed at the Institute for Protein Design have now opened the door to rational design of a whole new world of hyper-stable drug-like peptide structures. 3) cyclic peptides with non-canonical backbones and sequences. Experimentally determined structures for these peptides are nearly identical to their design models. EHEE Designed Peptide, Visual Illustration by Vikram Mulligan. The molecular surface is shown as a transparent blue shell, and the peptide’s backbone structure is pink. The amino acid’s side chains are white (carbon atoms), blue (nitrogen atoms) and red (oxygen atoms). The crisscrossing bonds that give the peptide its constrained, stable shape are in bright white. By including D-amino acids (mirror images of the L-amino acids), and thus expanding the palette of building blocks, Baker lab scientists designed peptides in a sequence and structure space sampled rarely by Nature. Indeed, the article describes successful design of a cyclic 2-helix peptide of mix chirality that represents a shape beyond natural secondary- and tertiary structure. These designed peptides also exhibit exceptional stability to thermal and chemical denaturation, and thus could serve as attractive scaffolds for design of novel peptide-based therapeutics. More broadly, development of this new computational toolkit to precisely design constrained peptides opens the door for “on-demand” development of a new generation of peptide-based therapeutics. See In the Pipeline. 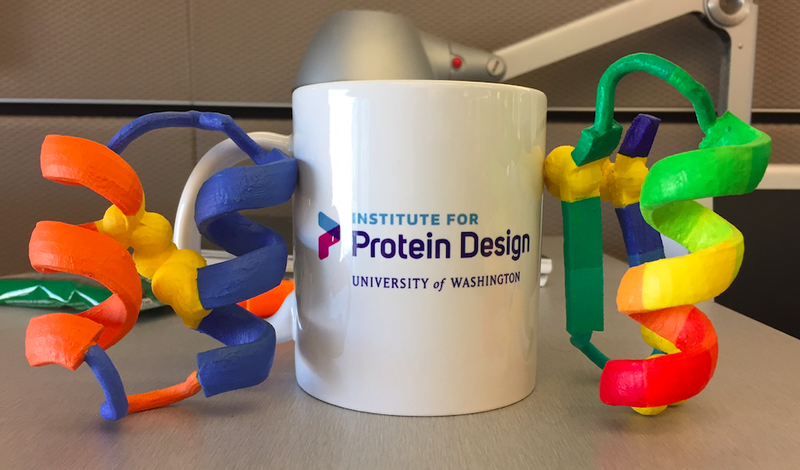 These and other breakthroughs in computational protein design are also covered in a Nature review article by David Baker, Po-Ssu Huang, and Scott E. Boyken entitled “The coming of age of de novo protein design”, part of special supplement on The Protein World. Illustrations of designed peptides with different configurations of two structures: tightly wound ribbons and flat, arrow-shaped ribbons. The National Institutes of Health provided partial support for this work through grants P50 AG005136, T32-H600035., GM094597, GM090205, and HHSN272201200025C. Additional funding was provided by The Three Dreamers.